The night my father died, I made dinner. It was a new recipe I was trying, a salad of roasted root vegetables, topped with a salmon filet, broiled in mustard. It was in the oven when my mother called, asked my husband to head to their house – my father had fallen again, and she needed help getting him up. He had been in and out of the hospital this fall, with complications from the flu, all complicated by his emphysema. The long periods of inactivity had cost him strength in his legs and he had fallen – more than once – had got back up, and kept going. That night was no different. I finished making dinner, fed the Nuni. Ken called me, told me he was going to help my mom get my dad upstairs. I put the Nuni down, and waited for my husband to come home. And instead I got a phone call. That my dad had collapsed, that the paramedics were there. I raced over to my parents’ house, and held my mother’s hand. As the paramedics came downstairs with somber faces. As the funeral home took away my father’s body. As we drank many many glasses of scotch, in shock and in disbelief and in his honor. I didn’t eat that dinner. Everything from before is before, and this is now, and everything is different. As my mother said, “How will I ever feel like cooking again?” Friends and family have come out of the woodwork, offering company and comfort and solace and meals. But we have found ourselves, my mother and I, slowly drawn back into the kitchen. Soothed by the solace of stirring, the rhythm of chopping and kneading. There is something so concrete about cooking. It is a task that requires active involvement, and concentration, so that your mind does not wander to other things, other images. I was not prepared for the physicality of grief. It hangs inside you, like a small dense singularity. You feel like something is sitting on your chest. It is exhausting to carry around this weight, to struggle against being consumed by it, and every night I find myself collapsing into bed, worn out by the effort of grieving. I was not prepared for the fact that grief is a feat of endurance. That you need your resources to power through, that a night of lost sleep, or a day of poor eating, can be distastrous, and end in torrents of tears. This dish, from Food and Wine, is nourishing. It takes the effort you want to put into it — whether that is the precision of cubes of squash, perfectly peeled sprouts, ora rough chop of unpeeled vegetables, blasted in a hot oven. It can be expanded to feed many or last for a week as leftovers. 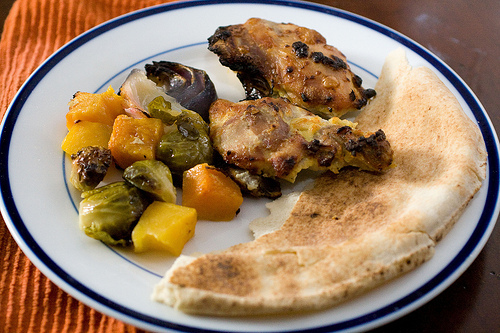 It is wholesome, with vegetables and chicken, yogurt and spices, and comforting, with the sweetness of onion and squash, the plain and unchallenging chicken resting atop. It offers the blessings of straightforwardness — there are no secret ingredients or tricky techniques. The chicken and vegetables shine on the plate, uncloaked by the platitudes of a rich sauce. It’s a dish that doesn’t make things better, but it does provide you the resources to keep on. Adapted from Food and Wine You can use peeled and cubed butternut squash here, as the original recipe calls for, or kabocha or delicata with the skin still on, cut into chunks. 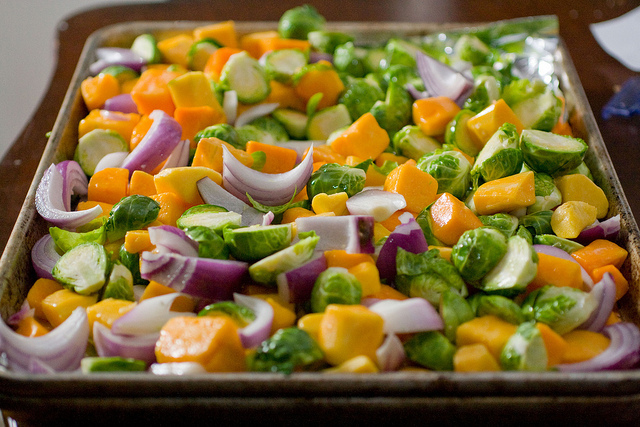 Toss the squash, onion, sprouts and ¼ cup of the oil. Spread onto a half sheet roasting pan lined with foil, and season liberally with salt and pepper. Using the same bowl, combine the ginger, garlic, curry powder, yogurt and remaining ¼ c. of oil and stir to mix. Toss the chicken in the yogurt mixture, and arrange on top of the vegetables. Roast for about 45 minutes, until the vegetables are tender and the chicken is browned. Serve with pita bread or naan. I’m so sorry for your loss. Sending warm thoughts and positive energy to you and your family. So sorry for the loss of your father, Kate! While I haven’t experienced it myself, I have heard that there is nothing like losing a parent. Props to you for having the strength to talk about it. Talking about your father, honoring him and time heal all. Keep cooking, it will keep you sane! What a devastating loss. I hope getting back in the kitchen does bring you some comfort and normalcy. As much as you need your spirit to heal, you need to nourish yourself. I love curried chicke. This one looks delightful! Sorry for your loss! Keeping you in my prayers. Be strong. That’s a great recipe for curried chicken. I ‘m sorry for your loss. I reread the post. I didn’t know from the intro that it was this recent. Will keep you in my prayers. Hi Kate, I’ve been reading your blog for a while but don’t usually comment. My grandfather died of other causes after a long, long decline due to emphysema. So I know that, even when there is a lead-up to the death of a loved one, death and the magnitude of grief can still be quite shocking. Although everyone experiences grief differently, your post was really well-expressed, and struck a chord with me. I’ll think of you and your family, and wish you the best. The chicken looks really tasty, too. you are a beautiful writer, and so obviously talented in expressing you thoughts with grace. What you have written so eloquently captures what so many people feel after such a devastating loss. I know it mirrors exactly what I felt when my father died five years ago. You are in our prayers. Kate – since I am a vegetarian I will remember the lovely winter vegetables and seasonings. I have the good fortune to have been asked 4 years ago to lead a support group for persons who have experienced the loss of a loved one. Your description of what grief ‘feels’ like – the ‘weight’ of it is so beautifully described. I especially applaud you for giving yourself permission to grieve openly – even while at work (smile). Thank you for being a good grief model. Be patient with yourself – and if it comforts you – please keep cooking! You’re description of grief is painfully beautiful. Continue to nourish and strengthen yourself with the flavors and recipes you shared with your father. He will forever be in your heart. Beautiful post. I’m very sorry to hear of the loss of your father, my thoughts are with you and your family. I will echo the thoughts of many others and say that your description of grief touched me. I pray that you and your mom are blessed and comforted by your kitchens and all the joy that your talented hands bring. Love your blog. Take care. This is such a beautifully written post. Every word is perfect. Thanks for sharing your ongoing story! As others have said, you write with such grace. I continue to think of you. Blessings to your father on the next part of his journey, and ease and grace to you, your mom, and all who miss him. The weight does get better — be gentle on yourself until it does. I lost my mother four years ago at the age of 47. Your description is perfect, and beautifully put. I am lucky because she was the best and I will miss her terribly. I had a year to be with her completely, my husband and I even moved in. In any case… I digress. Your recipe looks wonderful and I cannot wait to try it! I think I will on Friday when my husband returns from Montreal. I agree with everything you have all said. My daughter is brave and has been a gift to me (and to her dad) always. In the past few weeks, she has been cooking for me (and you), but I also have had the gift of having my oldest and dearest friends bring me comfort through shared meals. Thank you all for your support for Kate–and for understanding the power of shared meals. May you find much comfort in your family and friends during this painful period. Thank you so much for sharing such a personal passage. God Bless you. I am so sorry for your loss. The words of your grief and loss, while so sad, where very beautiful. May God bless you and your family. The vegetables look delicious. I plan to make this. So sorry for your loss. Glad you have cooking to take comfort in. It certainly helped me when I went through the same thing a few years ago. Hugs! I have been following your blog for over a year, enjoying both your recipes and your stories. I was really touched and saddened to read about your father. I will be making this dinner tomorrow night in honor of him and will keep your family in my thoughts. I love you dearly, and continue to wish you the strength to keep going. I’ll always be there along the way. I’m glad you’re back in the kitchen. I hope it’s helping a little. Your words are beautiful, and all I really know to say is, I’m sorry. So so sorry. I am so very sorry for your loss. What a beautiful post about the therapy of cooking and being in the kitchen. You blessed my family and I tonight – I made this recipe and it was absolutely delicious. I felt like a real cook. I feel sorry for their loss. This recipe, with lots of vegetables, is delightful, so I will draw from it. My sympathy to you and your family – losing a family member and grieving is extremely difficult and energy draining. Wanted you to know that your beautiful words comforted me as well as hopefully comforting yourself. May time be your best friend as you miss and mourn your Dad’s passing – believe me (I’ve been there) eventually the hurt will slowly go away. Blessings to you. I wish I’d read this post ages ago. “I was not prepared for the fact that grief is a feat of endurance.” The whole post is all so beautifully written, so painfully true. The recipe sounds good, too. I’ll try it, and think of you and your father. Your writing is beautiful even in its sorrow. Your description of grief is painted so that I can feel it with you. Thank you for sharing this (and the recipe). Best wishes.